On Wednesday afternoon, my wife Marija and I headed north after finishing work in the city of Adelaide. Our destination was Burra, about 160 km north of Adelaide, in the Mid North of South Australia. 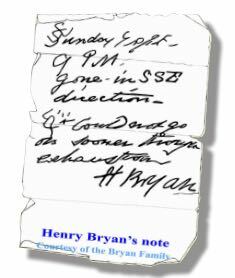 Our intention was to activate Mount Bryan summit for the UTC rollover for the New Year. In the Summits on the Air (SOTA) program, activators are awarded points for activating a summit every calendar year. So this was a unique opportunity to get to the top of Mount Bryan and be awarded the 8 SOTA activator points for 2014, and then a further 8 activator points for 2015, when the new UTC day ticked over (10.30 a.m. South Australian local time). Our accomodation for the night was the Burra Hotel. This little pub offers affordable accomodation. Although not The Ritz, the room was clean and tidy, and the hotel staff were very friendly. I stayed here back in 2013 when I last activated summits in the area. After booking in, we had a walk around the Burra township, which is a pastoral centre and historic tourist town. Burra actually commenced its life as a single company mining township, that by 1851 was a set of townships collectively known as ‘The Burra’. The Burra mines supplied about 89 % of South Australia’s copper, and about 5 % of the world’s copper for about 15 years. Unfortunately they were not serving meals at the Burra pub, so that night we had a meal at another one of the hotels in Burra, the Commercial Hotel. The meal there was very well priced and my rump steak was cooked to perfection. After our meal we retired to the main bar and chatted with some of the locals, whilst enjoying a few Bundy and cokes, and watching the 20-20 cricket at Adelaide Oval. We were in bed before midnight. Maybe that is a sign of us getting old. God help me when I’m 60! For more information on Burra, please have a look at ‘The History of Burra’ website at…..
Back to some info on the Mount Bryan summit. 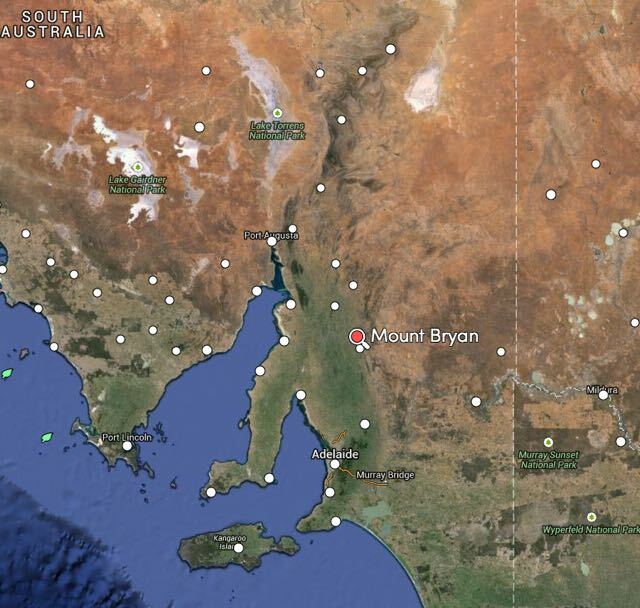 Mount Bryan is 933 metres ASL and is worth 8 SOTA points. It is located in the South East Region of the South Australian SOTA Association. Mount Bryan is the highest summit in that Region. It has previously been activated by myself, Ian VK5CZ, John VK5BJE, and Bob VK5FO. I last activated Mount Bryan summit in July 2013. For information on that activation, please have a look at my previous post….. The famous Heysen trail heads up to the summit from Mount Bryan East Road. This is about a 2 hour walk. And it was a hot day. Armed with some prior information, and before heading north I contacted the Wildongoleechie Hotel at Hallett, and spoke to the owner, Marie. Via Marie, I got in contact with the land owner of the property, on which the road leading to the top of the summit is situated on. I subsequently contacted Tony and he confirmed that we could access the summit via his property. 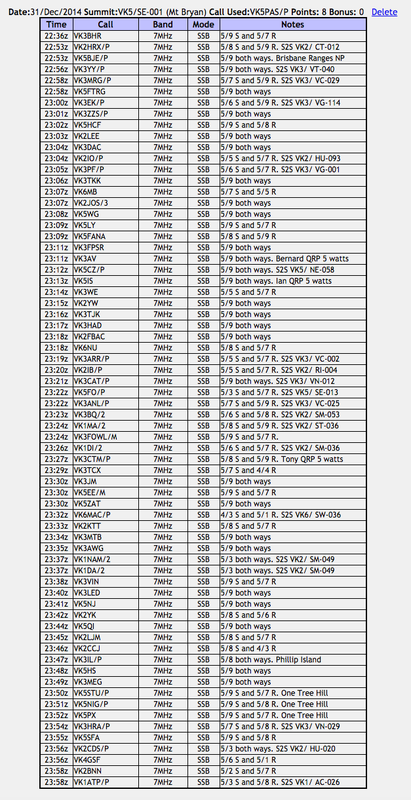 Contact details for Tony can be found on the SOTA notes for VK5/ SE-001. The Wildongoleechie Hotel is very unique and well worth a visit. 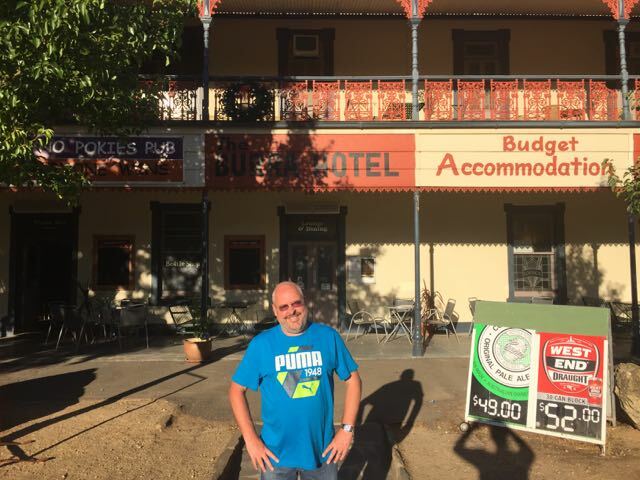 Here is a link to the Wildongoleechie Hotel website…..
After leaving Burra, Marija and I travelled north along the Barrier Highway, through the little township of Mount Bryan and then on to Hallett. We then turned right onto North Terrace and then onto Mount Bryan East Road. We travelled north along Mount Bryan East Road and reached the intersection with Scrub Road. We took a sharp right to continue along Mount Bryan East Road for a number of km. Rather than turning right onto the required road, Banbury Road, we continued along Mount Bryan East Road. We were lost. Oh, sorry Marija…I was lost! As we travelled along Mount Bryan East Road, we encountered numerous Western Grey kangaroos. So it was slow going. And we also saw a cheeky fox on the road, who wasn’t keen to move. Fortunately we came across a fantastic farmer, who gave us directions and pulled me out of my dilema and frustration. So, please look out for Banbury Road which runs off Mount Bryan East Road. As you travel along Banbury Road you will see a gate on the southern side of the road, which warns that the land is private property. Please do NOT enter the land unless you have the permission of the land owner. We then followed this dirt track, up through some gates, to the summit. The track leading to the summit is not passable for a conventional vehicle. A 4WD vehicle is definitely required as there are lots of washaways. 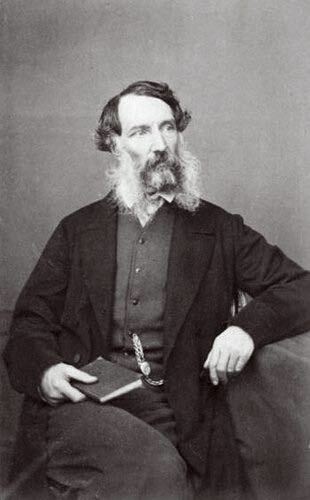 The very first European to sight what is now known as Mount Bryan was the explorer, Edward John Eyre (1815-1901). He explored the area in July 1839. 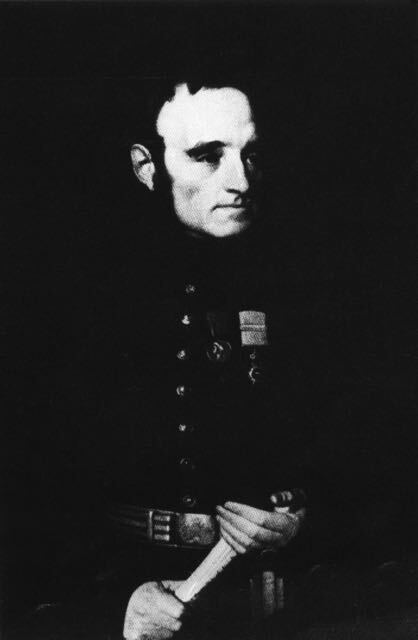 In 1842, the Colonial Surveyor, Lieutenant Edward Frome (1802-1890) , further explored the area and he erected a cairn on the summit. He is reported to have been the first European to have climbed the summit. Frome later visited the area, at which time he climbed the summit and made a number of sketches. 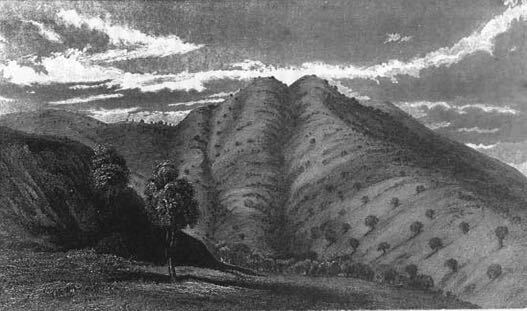 Below is a sketch of Mount Bryan by Frome. It never ceases to amaze me, the stupidty of some people and organisations. And here is another very sad example. Mount Bryan summit later became a Government Water Reserve and in 1970, the S.A. Water Authority demolished Frome’s historic cairn, to make way for other engineering works. A piece of South Australia’s history gone forever! But there are always saviours. In 2002, Glen Tiver, erected the current cairn in memory of his forebears and early explorers. Tiver’s forebears owned the property called ‘Rupera’, which encompassed Mount Bryan and its environs. 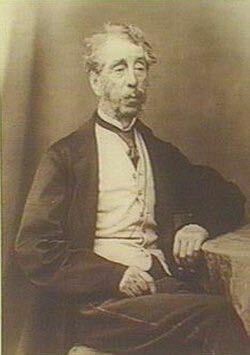 The expediiton was first discussed by Gawler and Sturt in November 1839. They proposed to cross Lake Alexandrina from Currency Creek, near the present town of Goolwa. They were to proceed up the Murray to the Great Bend, and then return overland to Adelaide. 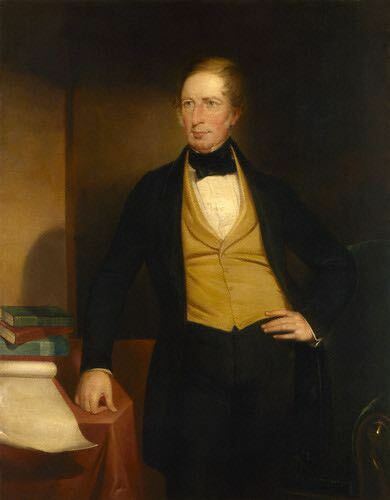 The expedition party consisted of Governor Gawler, his 15 year old daughter Julia, Captain Charles Sturt and his wife Charlotte, Eliza Arbuckle who was Charlotte Sturt’s maid servant, Henry Inman Superintendent of Police, Henry Bryan a house guest of Gawler, WIlliam Pullen the Colonial Marine Surveyor, Arthur Gell who was Gawler’s Personal Secretary, John Craig Aide to Gawler, Isaac Hearnshaw Aide to Gawler, and local aboriginal interpreters. Marija and I set up the gear at the trig point. Or what is left of the trig point. There are now just three 1.5 metre high metal poles, painted bright blue. I used one of the poles to secure my 7 metre squid pole to, with the use of a few octopus straps. For this activation I used my Yaesu FT-857d, and ran 30 watts. The antenna was the 40m/20m linked dipole. Prior to calling CQ, I had a look around the 40m band, and worked a few Summit to Summit stations including Compton VK2HRX on VK2/ CT-012, Glenn VK3YY on Spjon Kopje VK3/ VT-040, and Marshall VK3MRG on Briarty Hill VK3/ VC-029. I also tracked down John VK5BJE who was portable in the Brisbane Ranges National Park in Victoria. I then proppped on 7.085 and called CQ and this was answered by Tom VK5FTRG in Millicent, and then Rob VK3EK who was portable on Fainting Ridge, VK3/ VG-114. I went on to have 69 QSOs prior to the UTC rollover. This included 21 Summit to Summit contacts before the UTC rollover. My first contact after the UTC rollover was with Larry VK5LY in The Riverland. This was followed by Steve VK5SFA, and then Peter VK3PF who was portable on SOTA peak VK3/ VG-001. I went on to work a total of 72 stations after the UTC rollover. This included 26 Summit to Summit contacts. After a total of 2 & 1/2 hours on the summit, I had a total of 146 contacts in the log on 40m ssb and 20m ssb. I had 69 contacts before the UTC rollover and then a further 72 contacts after the UTC rollover. I also managed a total of 47 Summit to Summit contacts, with a total of 260 S2S points. Of the 18 alerts on SOTAWatch for pre UTC rollover, I managed to make contact with 13. And there were 5 alerts for activations after the UTC rollover. I managed to work 3 of those. There were many other activators who did not place an alert on SOTAWatch, that I was fortunate enough to get in the log. This activation was a lot of fun and I will certainly try to activate another summit this year for the New Year rollover. After getting down from Mount Bryan, we headed for the WIldongoleechie Hotel, but sadly it was closed. 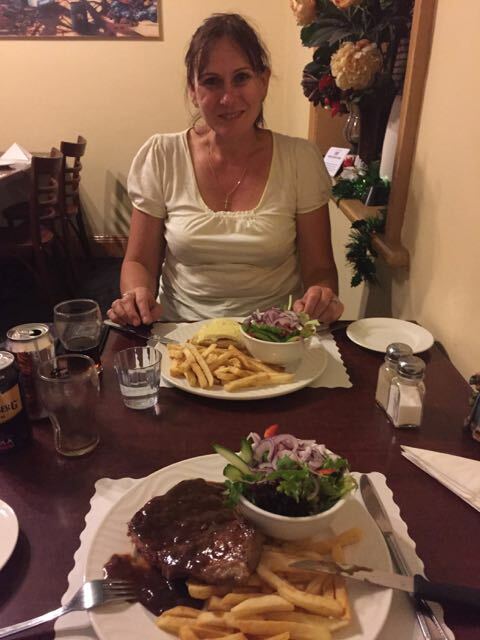 So instead, we travelled back into Burra and had a feed at the Royal Exchange Hotel. Again, this was an excellent meal at a very good price. Discover Murray, <http://www.murrayriver.com.au/morgan/mt-bryan-expedition/&gt;, viewed 3rd December 2015. Many thanks for taking the time to have a look at my WordPress site.